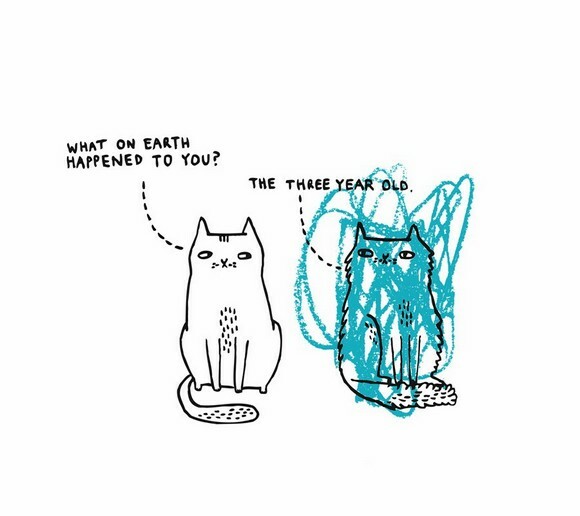 * A Cat's Life by Gemma Correll. My boyfriend gave me A Cat's Life the day my little Avalon crossed his rainbow bridge and dedicated the book to him. Therefore it'll always have a special place in my heart. It's a collection of drawings of cats who perform their day to day activities. Very funny and recognizable. I'm currently also addicted to Gemma Correll's blog: http://gemma-correll.blogspot.be. * Homer's Odyssey by Gwen Cooper. When twenty-something Gwen Cooper adopts Homer the blind cat, she still has to build up a career, a relationship, a life. The positivism and bravery of her cat (he even chases off a burglar), however, help her learn and grow and make the right decisions. Homer's Odyssey is so much more than a memoir about a blind cat. It's also an honest account of how the author overcame life's obstacles and how she survived September 11. Homer's Odyssey was extremely well written and touching, but never sentimental. I cried on multiple occasions, not because bad things happened, but because the emotions were so pure. A jewel of a book. * Cross-Eyed by Sarah Allen. The seven short stories in this collection each describe a slice of life. But where most stories of other authors focus on change, Sarah Allen focuses on how life remains the same. If there is any change, it's only minimal and temporary. The style is subtle. By holding back on important information, you get a feel of the situation as if you were an observer instead of being right in the middle of the drama. * Mud. Two young boys encounter a fugitive (Mathew McConaughey) and form a pact to help him evade the bounty hunters on his trail and to reunite him with his true love. Mud is a beautiful coming-of-age story in which the boys learn that life and love don't always resemble a fairy tale. A very good film, but too much on the nose and kind to be truly effective. * Sharknado. Sharks are literally flying around town and eating everyone on their way. Kudos for the idea which sounds way funnier than it actually is. * The Unborn. At the time of its release I liked this horror movie about a girl whose dead twin brother wants to be reborn by taking possession of her. Funny how one's opinion changes as we grow older. * Back To The Future. Still a hugely enjoyable classic. Original, funny, entertaining, cute, suspenseful. The perfect feel-good movie. * Back To The Future 2. The first half of the film fails because of the bad make-up and ridiculous view of 'the future' which is now the present. The second half, which takes place in 1953, is way funnier. Overall, Back To The Future 2 tries too hard for its own good. * Sirius. Stephen Greer claims in this documentary that there are existing (alien) energy technologies that would change the world as we know it. To prove his theories about alien life, he concentrates on the Atacama humanoid, a 6-inch skeleton that was discovered in the Atacama desert in Chile.Didn't learn much from it. * Before Midnight. What happened to Julie Delpy's charming character from Before Sunrise? In Before Midnight she's become highly unlikeable, constantly starting fights and misinterpreting everything as if she's doing it on purpose. Luckily there's Ethan Hawke and the beautiful Greek setting. * St. Elmo's Fire. Self-centered and obnoxious characters... a weak story line... plot holes... Was this ensemble movie really a classic in the eighties? * Tales From The Hood. This Tales From The Crypt with an African-American spin was recommended to me by a friend as one of the most entertaining horror movies of the 90s. Don't believe him. * Stridulum / The Visitor. Household names such as John Huston, Lance Henriksen and Shelley Winters parade in this little-known horror movie about an evil girl who bears the seeds of an alien criminal. Followers of that alien want to impregnate the girl's mother with a new evil creature while a strange man tries to save the world. There's also a Jesus-like figure, a legion of bald children, a flock of killer birds and an exploding basket ball. Stridulum is a very weird, hypnotic film that is deliberately slow at times. Monologues and observational scenes last for several minutes. And just when you start to fall asleep, the film changes its pace with loud music that seems to come right out of an Italian police movie from the seventies. Minutes later you're dozing off back to your hypnotic Stridulum state. * Metro Manila. A Filipino family exchanges the rice fields for Manila, hoping for a better life. What they will encounter is poverty, violence and abuse. Metro Manila is a hard but realistic film, interspersed with rare moments of kindness and hope. Although written and directed by a Brit, the film is entirely shot in the Philippines and spoken in the Tagalog dialect. A beautiful and supenseful thriller that will get to your very core. Winner of the Sundance audience award. * Vinyan. Fabrice Du Weltz knows what makes a good movie and he knows how to translate that vision into his own work. There's much to be admired in this film: the stunning visual finds, the film's structure, the actors, the slight reminiscence to classics such as Don't Look Now and Who Can Kill A Child, the depth of the story (a couple looking for their missing son in Thailand)... Vinyan had only one weakness: the lack of emotional attachment. * Hatchet 3. I loved that Hatchet 3 reminded me of eighties slashers such as Twisted Nightmare. What I didn't love was the comedic aspect that ruined most of the movie. * Pretty In Pink. This was one of my favorite romantic comedies when I was a kid. I've outgrown the genre, but I can see why I liked Pretty In Pink so much before. It's cute to the extreme. The main characters are super sweet for a change, not those foul-mouthed, self-centered characters of today's cinema. Still enjoyed this a lot and I'm sure today's youth will too. * The Conjuring. If movies such as Insidious, Mama and A Haunting In Connecticut scared you, then The Conjuring, which is similar in style and scares, will put you out of your skin as well. Just not my kind of thing. * Dexter season 8 (episode 4 - 7). Still a fun series, even though the twists are a bit silly. I wonder how they will end this last season. Any ideas? * Under The Dome (episode 4 - 7). The main reason I'm still watching is because I want to know where that mysterious dome comes from. Can anybody please tell me how the story ends so I can stop following? * The dark ambient music of Lustmord's The Word As Power. * Victim Of Love by Charles Bradley and The Menahan Street Band, a soul artist who lived in poverty for over sixty years and who recently became an overnight succes. His music brings you right back to the seventies. * Angelo Badalamenti's soundtrack for The Comfort Of Strangers, one of my favorite films. Have you read any of the above books or seen any of the above movies? What do you think of them? 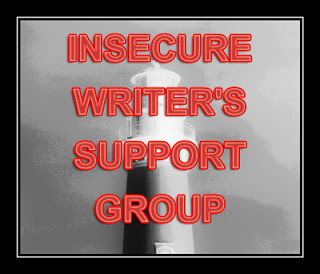 Also, it's time again for a new chapter of the Insecure Writer's Support Group. A lot has changed this past month for me, changes so profound they have influenced my writing a great deal. As most of you know, I was working on new supernatural thriller that was moving along just fine. That book, however, has now been (temporarily) shelved. July was characterized by the death of both my grandfather and my cat, two people (by lack of a better word) who meant the world to me. Writing about my cat had become my way of dealing with the pain. I currently have over fifty pages and it'll become a cat memoir, a little like the Homer book mentioned above. By writing about my cat, some of the things I got stuck with for my supernatural thriller also fell into place. It's amazing how my cat inspires and helps me even when he's not there anymore. It may not have been a logical decision to stop working on my supernatural thriller and start something that is so entirely different than what I usually do, but I'm so certain that this was the right thing to do. Do you sometimes stop writing a story and begin something entirely different, just because your feeling tells you you should? What are your experiences with it? You have been in my thoughts since I heard about both your losses in July. So happy you've been writing so much inspired by your baby. I think I need a copy of A Cat's Life, sounds like something I would enjoy. Also thanks for sharing the link to Gemma Correll's blog, what a great find! Back to the Future 2 : they set themselves up with an insurmountable problem at the end of BTTF 1. It was originally not the intention to have any sequels to the movie. So the whole 2015 thing at the end wasn't meant to get visited. But then the demand for the sequels came, and they had to adress that. What do you do with a future you have no idea what it is going to look like (around 1990) ? There's a big chance that, if you approach it seriously, it won't hold up as 2015 starts to draw nearer. So they made the decision to make it funny and over the top. Which, eventhough more than half the gadgets we get presented with, we still don't have, still makes for a fun ride and there are a lot of laughs to be had in the BTTF future. So bare that in mind, next time you watch it. The Conjuring : haven't seen it yet, but I definitely will. I didn't like Mama (though I did like the original short film), but I did like Sinister. Quite well made for a low budget movie. And Haunting in Connecticut 1 I liked too. Because it managed to make me jump at some points, which is rather hard to do with me. So basically if a jump scare actually manages to make me jump, the movie scores points in my book. :-D Haunting in Connecticut 2 I didn't overly like. Too sterile. Too much of a "seen it before" formula. Thank you for visiting my Cat Blog, really. I'm not much into "horror". But since you are, I thought I might mention that in 1979 I was visiting a friend in NYC and we were in the 2nd line (and missed being first by about 4 people) for "some new movie" called 'Alien' ('no one can hear you scream in space' ) innocently thinking some alien was the victim in the movie. Then the first viewers came out, pale and slack-jawed!. We looked at each other and I said "OMG, what have we gotten ourselves in for?" If we hadn't already bought the tickets,I would have left. You know the expression "crap your pants". I came close. As I said, I'm not "into" horror movies. Psycho was slightly boring but I liked the twist at the end; Halloween movies were moderately interesting concerning creative ways to kill people. Such movies don't bother me at all. I don't believe them even while watching (and I understand the willing suspension of disbelief for sci-fi which I love). But "Alien" scared me damn near close to to death. Seriously, I walked out of the theater with a heartbeat around double. I actually had to sit down for several minutes. My friend gave me a T-shirt that said "Here Jonesie" on the front and "Alien" on the back and I've kept it through all the years. First time i saw Alien was on a tv that was turned silent. So all I got was picture. And I was glued to the screen. It was so compelling and scary, even without the sound. If a movie can do that, then it is without a doubt a true masterpiece. After all these years Alien still is my favorite movie of all time. Sorry July was so terrible. I have stopped in the middle of something but usually because I felt it wasn't working. Some I go back to and some I never do. You just need to follow your heart and what feels right. I'm sorry for your losses. I'm so sorry you lost your grandfather and your cat. Some of my fiction was written as a means of therapy, so I can relate to that. that is such a long list of watching!! sorry about your grandfather and cat. I know it isn't easy. I wish you the best recovery! !